Solar steam generators produce clean water by converting energy from the sun into heat, which evaporates seawater, leaving salts and other impurities behind. Then, the steam is collected and condensed into clean water. Existing solar steam generators contain a flat photothermal material, which produces heat from absorbed light. Although these devices are fairly efficient, they still lose energy by heat dissipation from the material into the air. Peng Wang and colleagues wondered if they could improve energy efficiency by designing a three-dimensional photothermal material. They based their structure on the Miura fold of origami, which consists of interlocking parallelograms that form "mountains" and "valleys" within the 3-D structure. 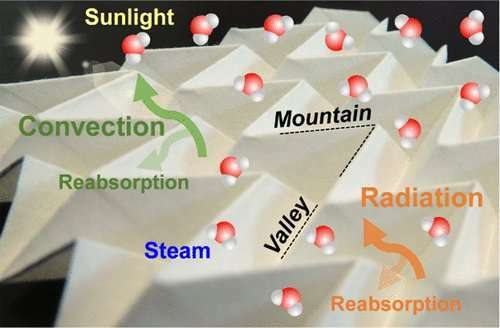 The researchers made their solar steam generator by depositing a light-absorbing nanocarbon composite onto a cellulose membrane that was patterned with the Miura fold. They found that their 3-D device had a 50 percent higher evaporation rate than a flat 2-D device. In addition, the efficiency of the 3-D structure approached 100 percent, compared with 71 percent for the 2-D material. The researchers say that, compared to a flat surface, origami "valleys" capture the sunlight better so that less is lost to reflection. In addition, heat can flow from the valleys toward the cooler "mountains," evaporating water along the way instead of being lost to the air.